With their losing records and their shaky defenses and their injury-depleted rosters, the Washington Redskins and New York Giants are not exactly ready for prime time, let alone for a national audience tuning in on Thanksgiving night. Not only did Washington fall apart last weekend, letting a 15-point lead disappear in the final three minutes of what became an overtime loss, but its list of players on injured reserve has risen to 15. Asked how that affects his ability to game plan, Redskins coach Jay Gruden joked Wednesday: "Well, does it look like I've slept a lot?" The Redskins (4-6), hosting a Thanksgiving Day game for the first time, are technically still able to make the playoffs -- they are, after all, entering the easy-as-can-be portion of their schedule after playing division leaders a half-dozen times -- but they also have lost four of their past five games. "Got to win. Got to get a W. We're on the ropes right now. Really are. Been hit. Backs against it. We've just got to come out and start swinging and getting back into the center of the ring," Redskins cornerback Josh Norman said. "If we can get this one, hey, a domino effect? Who knows?" The main question facing the Giants (2-8) at this point, meanwhile, is whether there is any way coach Ben McAdoo can hold onto his job. A year after getting to the postseason, Eli Manning and New York have been among the league's dregs, even losing to the otherwise-winless San Francisco 49ers. Somehow, though, the Giants pulled off a surprise last weekend, defeating AFC West leader Kansas City, so maybe they won't just be easy pickings on Turkey Day. "It's the same approach we've had all year: We go into these games expecting to win," defensive lineman Damon Harrison said. "That doesn't change anything, whether the playoff hunt is over or whether we're still in it or not." 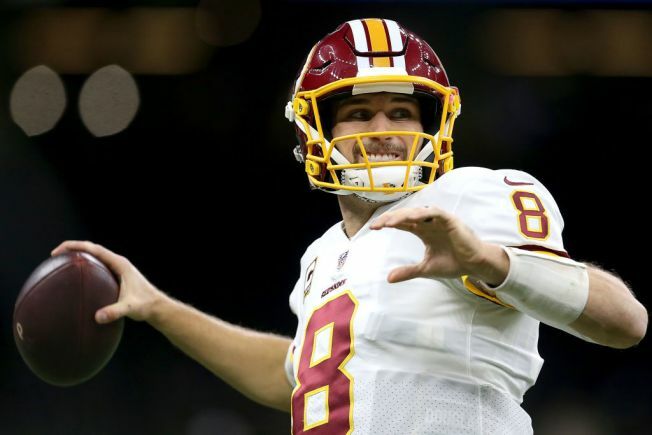 Redskins quarterback Kirk Cousins, he of the still-up-in-the-air future, is third in the NFL in yards passing, has a passer rating over 100 and has managed to play well despite a makeshift offensive line and little to speak of in terms of playmakers. Asked in what ways he has gotten better this season, Cousins replied: "Every area of quarterbacking. I think I've done a much better job of handling protections, of feeling the rush, of knowing when to take sacks, when to throw it away, when to throw it into tight windows, working through progressions. Knowing when to run, when to take off and use my legs. Just throwing with accuracy. Being decisive. All the things you have to do at this position, I think I've continued to improve." Both of these teams are struggling to find offensive linemen. The Redskins put two starters, center Spencer Long and left guard Shawn Lauvao, on IR this week. And Long's backup, Chase Rouiller, is out with a broken hand, leaving third-stringer Tony Bergstrom to make his first NFL start since 2015. Plus, their best lineman, left tackle Trent Williams, will be a game-time decision. The Giants will be forced to use their eighth different starting offensive line of the season, because right guard D.J. Fluker's injured right foot won't allow him to play Thursday. The likely replacements are John Greco, a 10-year veteran signed last week, or first-year player Jon Halapio. With Thompson, Washington's leading rusher and receiver, joining starting running back Rob Kelley on IR, rookie Samaje Perine will get the bulk of Washington's carries again. He ran for 117 yards and a TD against New Orleans last week, but he also dropped a pass in OT. The biggest challenge for Perine is probably helping in pass protection. "It's almost unfair to him as a rookie to have that much put on him," Cousins said, "but we just don't have a choice." Neither of these teams has been able to stop opponents with any consistency. The Giants allow 396.6 yards per game, which ranks 31st in the 32-team league. The Redskins give up an average of 26.6 points, which puts them 31st in that category.